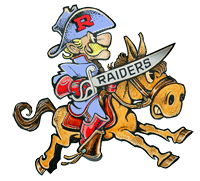 Raiders cruise past Patriots 62-15. Rummel defeated John Curtis Wednesday night at the Curtis gymnasium 62-15. The Raiders recorded four falls, two technical falls and a disqualification. The Patriots recorded two pins and a decision. As if there is not enough already on a sixth-grader's mind, Curtis' Lane Boudreaux must ponder what to do next against Rummel's Robert Fairchild. Rummel's Tyler Frame lifts Devon Pons as his coach, Rod Cusachs, looks on. * The dual meet started at 170 lbs. Devyn Breaud (Rummel Junior: 31-11) pinned. Prentice Spurlock (Curtis Sophomore: 12-7) in 2:46. This match lasted a very exciting 2:46. Spurlock and Breaud traded single-leg and double-leg shots in the first period, and it was Spurlock who finally converted one to a takedown with 30 seconds remaining. At one point he came close to turning Breaud, but the more experienced Raider yielded no back points. Breaud tried to switch Spurlock, who stepped over Breaud, but Breaud managed to slip underneath Spurlock and score an escape with 0:01 remaining. The first period ended with Spurlock ahead 2-1. Breaud used a Granby roll to try to escape from Spurlock, but the Patriot would not release him and they ended up standing with Spurlock still in control and holding an inside single. Breaud dropped his knee back onto the mat and tried a lateral drop. Spurlock almost caught Breaud on his back but Breaud bridged Spurlock to Spurlock's back and secured both of Spurlock's arms. Spurlock bridged valiantly, but Breaud was able to apply enough pressure to score the fall. Robert Fairchild scored a technical fall over Lane Boudreaux: 22-5 in 5:56. Sixth-grader Lane Boudreaux of Curtis put forth a good effort against the Rummel eight-grader. But Fairchild took advantage of moves Boudreaux tried but could not fully complete, scoring enough points to merit the technical fall. Tyler Mire decisioned Bryce Cortez 10-2. Cortez is good and worthy of a top-five ranking in Division III. But Mire, who should be seeded third in Division I, dominated the match. Matt Calcote won by 1st-round disqualification over Corey Ronan. Calcote was leading 6-1 when Ronan was disqualified for unsportsmanlike conduct. But Ronan's actions were not blatantly offensive. Like most of Calcote's opponents this season, and all of them during February of 2011 and 2012, Ronan probably just wanted the match to be over. Rick LaCava won by forfeit. Joe Kerry pinned Nicholas Bloomer in 1:38. Kerry has had a very good season, which included being voted the Outstanding Wrestler at the George Trygg Memorial. Bloomer had only had six matches all year, and his three losses were to Andrew Poussan, Abram Sellers and Brent Matherne. That is one very sharp learning curve as two of those wrestlers defeated Kerry this season. Tyler Frame scored a technical fall over Devin Pons: 20-3 in 3:18. The rumors of Frame's injury lingering have been greatly exaggerated Frame should have charged admission for the clinic he provided. And that in no way slights Mr. Pons' abilities. Cody Lacoste pinned Cody Hamrick in 3:54. Both wrestlers had chances to win this one, but Lacoste proved more experienced. And it is safe to say the enthusiasm of the crowd was felt equally by each athlete. G'Corey Fullilove pinned Guillermo Suarez in 3:48. An argument can be made for Fullilove to be the #1 seed in Division III. A first period leg cramp hamstringed him for a few minutes, but he came back very strong to earn his second round fall. Michael Darwin pinned Baron Clofer in 4:46. This match was close at first, with Darwin having to earn a first period takedown to which a penalty point was also added. Clofer will be seeded pretty high in Division III, but the experience Darwin has gained by taking the best at 170 lbs. in Division I "to the brink" paid off in the end. Aaron Maddox won by forfeit. Ryan Hanley pinned Patrick Martin in 3:38. Hanley should place better in the state tournament than this Website predicts in its rankings. Martin is ranked third in Division III but has not faced the caliber of competition that Hanley has. Mason Pembo decisioned Tyler Fontana 8-2. Pembo methodically controlled the vast majority of the match to record Curtis' second win of the evening. Rummel took a while to settle on someone at 220 lbs. and Fontana did fine as his first match was on January 5th. Undefeated on the season, there was no reason to believe Lemoine would leave the gym Wednesday night with a blemished record. Yet at the end of the second period he was behind 4-2. It was not because Lemoine was not trying, but after he took O'Donnell down in the first period, and started in the top position in the second period, Lemoine could not do much with the wrestler from Rummel. Perhaps out of frustration, or more likely ennui, he made some mistakes that cost him one, then another, and then two penalty points, which accounted for O'Donnell's scoring. In similar situations some wrestlers would let their opponents escape and rely on their takedowns. But Lemoine is one of the lightest wrestlers in a weight class separated from the next lowest one by 55 pounds. Getting the larger guys to the mat is not all that easy. In the third period Lemoine refocused his frustration and quickly escaped, took the then exhausted O'Donnell down, and just "man-handled" the Raider to his back to score a fall and remain undefeated.